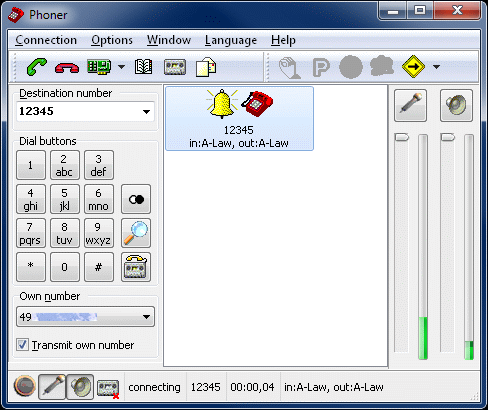 Phoner is a softphone capable of placing/receiving VoIP calls through SIP. It also supports sending emails with built-in SMTP client, sending of SMS to mobile phones, recording of calls, working as answering machine with remote polling, etc. Note: Phoner is a more powerful version of PhonerLite, with more features thrown in. They use the same DLL and configuration data (sipper.ini) and can co-exist in the same folder. How to extract: Download the ZIP package and extract to a folder of your choice. Launch phoner.exe. Fix call terminations after some minutes in SIP mode (Session Timers). So if Stealth: "No" where it writes to then? Phoner is at version 2.38 as of this posting. It works great from a USB stick. Tip: if you want audio ring tones and other sounds (feedback), then in menu "Options" sub-menu "Voices" change the settings for all (Incoming call, Outgoing call, Busy, etc...) from "x\install directory\Phoner\RingIn.wav" etc, to "..\Phoner\RingIn.wav" etc, etc... (without quotes). This way the sound files will work for any drive lettter your thumb drive gets allocated. This software is not noisefree. Annoying and very disturbing cracks when using wifi with reduced bandwidth makes it unusable.